IDEA is based on the principles of dialogue, action, leadership and education – all essential ingredients for equipping a generation to create positive and sustainable environmental change. Exchange of ideas through regular forum events and local groups – both at national and international level. Participation and organization of the youth camps, events and specific environmental projects. Encouraging and recognizing young leaders, who can effectively spread the word and lead others in our environmental endeavors. Rapid development and swift industrialization of the South Caucasus region has brought about environmental concerns and raised many ecological issues in recent years. Azerbaijan, as a country blessed with natural oil and gas reserves and located in an environmentally challenging region, has also been active in solidifying and focusing society efforts to thwart the dangers posed by ecological challenges. To that end, the year of 2010 was announced the “Year of Ecology” in Azerbaijan. Despite its young age, the country managed to reshuffle and refocus on environmental-friendly industries and businesses, while engaging younger generation in awareness-building and empowering each member of its community to become the leader for local environmental action. The first ever Center for Restoration and Rehabilitation of Wild Nature in the South Caucasus was established in Azerbaijan. The country is also a proud host to nine of eleven existing climatic zones in the world and is well known for its subtropical palm trees and pineapples in the south and alpine glaciers in the north. This factor also provides for incredible diversity of flora and fauna in the wild nature of the Caucasus. The young generation in Azerbaijan understands the difficulty and urgency of the environmental burdens of the time and shares a common passion for the environment. 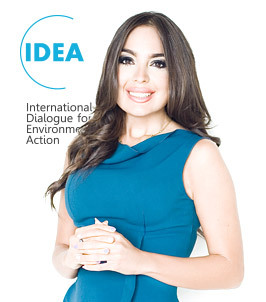 IDEA (International Dialogue for Environmental Action) Public Association was launched by the Vice-President of the Heydar Aliyev Foundation Mrs. Leyla Aliyeva on July 12, 2011 in Baku. The organization is aimed at promoting public awareness of environmental issues and action, collaboration with youth, education in the field of environmental problems and finding proper solutions for them. During these three years the organization has fulfilled various projects, from tree planting activity for young environmentalists and ordinary students, to the international photo contest for children “Children’s Eyes on Earth”, represented by 1200 participants from 5 continents and 90 countries. 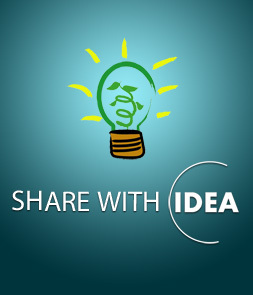 IDEA has also become a network of young environmentalists from all around the globe, holding a number of conferences and meetings with the participation of international experts, such as the conference in Gabala in November 2011, and the “Green Week” series of conferences held jointly with UNEP Regional Office for Europe in November 2012. IDEA is all about working with young people to put environmental awareness and action at the heart of family, community and national life. Our mission is to create a real and virtual community of young people, regionally and internationally, with a shared passion for the environment; nurture virtual community through an open dialogue which provides information, inspiration and practical calls for environmental actions; empower each member of this community to become an ambassador and leader for local environmental awareness and action. Around the world, young people are waking up to the challenge of the environment. It is in our hands to create a future where we live in harmony with the nature which supports us and gives us life.